Buying an espresso machine can be a bit of a minefield as there is simply so much choice on the market that it can be mind-boggling. What is best for one person might not be best for the other, but there are several things that should be considered when trying to evaluate the best value in espresso machines. One of the most crucial things when preparing espresso is the grinder used to grind up the beans. If your grinder is poor quality, even the best espresso maker won’t be able to turn the ground up coffee into fabulous coffee. 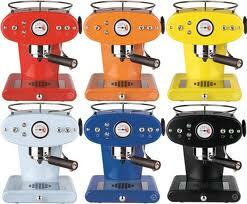 Conversely, a good quality grinder will produce good coffee even in a budget espresso maker. It is well worth splashing out on a quality grinder which will last a lifetime and this should be factored in to the budget when thinking of investing in a new espresso machine. Most first time buyers of espresso machines will plump for the automatic or semi-automatic machines as they are easier to use and require less expertise. Most of the automatic machines do everything for you and all you have to do is switch them on to start making coffee and off again when you’re finished. They are simple to learn how to work. Manual machines have a more old fashioned look about them and they have a lever instead of being automated. Using these sorts of espresso machines requires much more effort and involvement, and as there is scope for human error there is always the chance that the coffee will never be the same two times running. Budget is always a consideration when buying a new appliance and the general rule of thumb is that the more you can afford to spend, the better the machine you will get. That’s not to say that budget machines are bad, they may just not last as well as the more expensive machines. Have a long think about how much you are prepared to spend, bearing in mind that the espresso machine will be making coffee for years to come. Factor in the cost of the grinder and then once you have your final figure, start looking around on the internet for reviews of machines around the amount you’re prepared to spend. A name which keeps coming up in best buy reports is definitely something to consider, but there is no substitute for going into a store and trying out some of the machines to see which one suits your needs best. When looking for a new machine, go to a vendor who is an expert in the market and can talk confidently about the sorts of machines and the differences between this. Go to a specialist coffee vendor rather than a general department store to get the most knowledgeable staff and don’t be afraid to quiz them and ask questions to help work out which machine is best for you.